Even though your gutters are “out of sight, out of mind” for the majority of the time, they do play a very important role in the structural integrity of your house. Keeping the gutters clean and well maintained is the best way to avoid costly repairs in the future. As well as structural damage caused by leaking rain water, the resulting damp can also cause health issues for you and your family. We are happy to provide a regular gutter maintenance service or a one off gutter clean. Although we would recommend a yearly clean and check of a property’s guttering, the ideal frequency of cleaning is very much specific to the individual property. The two most common problems with guttering are blockages in the guttering itself and also blocked downpipes. These blockages are usually caused by debris such as leaves and roof moss. Leaking gutter joints are another common problem and are caused in much the same way by debris getting stuck in a joint or by simple wear and tear. If you have a damp problem in your home then the first place to look for a reason is often the gutters. Gutter cleaning on a regular basis is the best way to keep these problems from occurring. Using the market leading commercial wet/dry vacuum machines from Skyvac we are able to safely and efficiently clean gutters up to 40ft high without the use of ladders of platforms. All our operatives are fully trained in the use of the vacuum machines and are fully insured to use the ladders if the job requires them to. 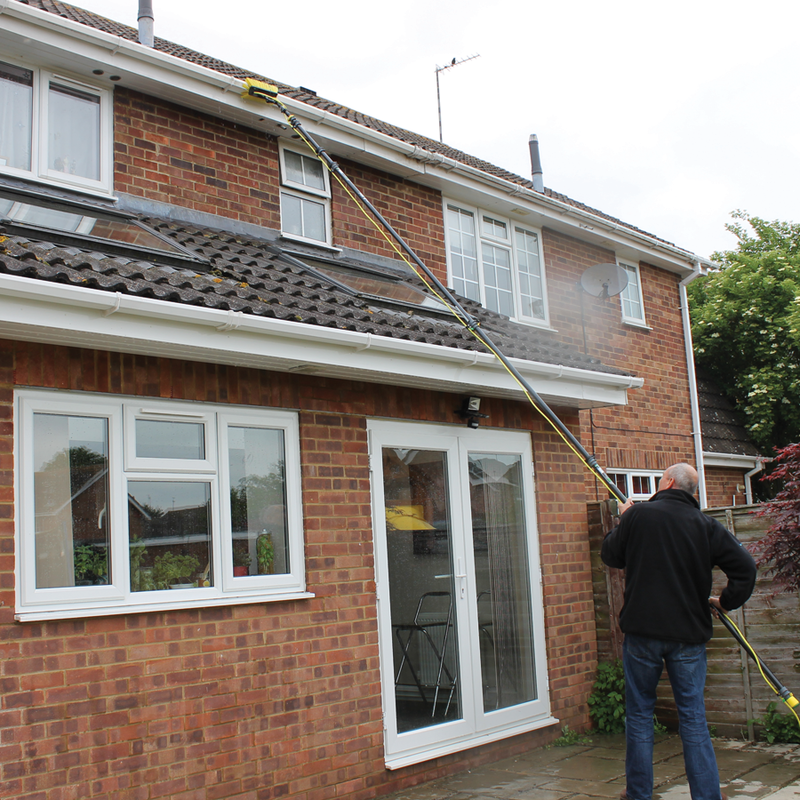 Our long reach carbon fibre poles allow us to clean difficult to access gutters such as those above conservatories and garages with ease. If we detect as more serious fault we will show you a pictorial report and can provide you with a quick, no obligation quote to fix the problem.